Commandos are fighting to clear the last gunmen from two luxury hotels in Mumbai, more than a day after a series of attacks across the city. 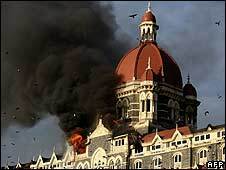 The Taj Mahal hotel was nearly free of gunmen, officials said, but operations continued at the Oberoi-Trident hotel. A third stand-off at a Jewish centre is said to be ongoing, although seven hostages were reportedly freed earlier. Gunmen armed with automatic weapons and grenades targeted at least seven sites in Mumbai late on Wednesday, opening fire indiscriminately on crowds at a major railway station, the two hotels, the Jewish centre, a hospital and a cafe frequented by foreigners. The attacks are the worst in India's commercial capital since nearly 200 people were killed in a series of bombings in 2006. 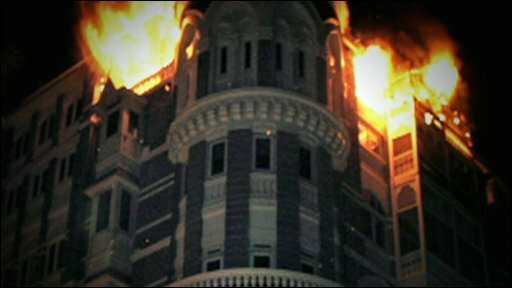 The police officer in charge of the operation at the Taj Mahal Palace said the search of the hotel was almost over, with just one wounded gunmen believed to be still inside. The BBC's Damian Grammaticas, who is outside the Oberoi Trident hotel, says that according to police there are still two gunmen barricaded on the 18th floor. 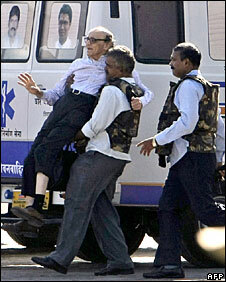 Overnight Indian security forces rescued 39 people. Security operations are ongoing and police believe up to 50 people might still be trapped. There have been sporadic explosions and gunfire. Police officials say they are searching the building room-by-room, first blowing the doors off and throwing in stun grenades. There is still some confusion about the hostage situation at the Jewish prayer and study centre, run by the ultra-Orthodox outreach group Chabad Lubavitch. Indian officials say seven hostages had been freed, but an Israeli diplomat closely monitoring the site said people were still being held there. • The Pakistan-based militant group Lashkar-e-Toiba, which has been blamed for past bombings in India, denied any role in the attacks. In a televised address, the Indian prime minister said the government would "take whatever measures are necessary to ensure the safety and security of our citizens". Mr Singh said the attackers were based "outside the country" and that India would not tolerate "neighbours" who provide a haven to militants targeting it. He described the attacks as "well-planned and well-orchestrated... intended to create a sense of panic by choosing high profile targets and indiscriminately killing foreigners". India has complained in the past that attacks on its soil have been carried out by groups based in Pakistan, although relations between the two countries have improved in recent years and Pakistani leaders were swift to condemn the latest attacks. Maj Gen Hooda said authorities had intercepted conversations between some of the attackers speaking in Punjabi, an apparent reference to Pakistan-based militants. Earlier reports said the attackers spoke Hindi, indicating they were from India. Eyewitnesses at the hotels said the attackers were singling out British and American passport holders. If the reports are true, our security correspondent Frank Gardner says it implies an Islamist motive - attacks inspired or co-ordinated by al-Qaeda. But as investigators from other countries join the hunt, he says, most intelligence officials are keeping an open mind as the attacks have thrown up conflicting clues. Co-ordinated, mass casualty attacks that target civilians and undefended buildings are very much in the al-Qaeda mould, and the apparent singling out of Westerners also points to a global Jihadist agenda. But our correspondent says al-Qaeda and its affiliates in the region tend to favour massive truck bombs driven into buildings by suicidal volunteers - that didn't happen in Mumbai. He says al-Qaeda are also acutely media-savvy, filming their attacks and in the case of hostages, sometimes murdering them on camera. Again, that does not appear to have happened this time.